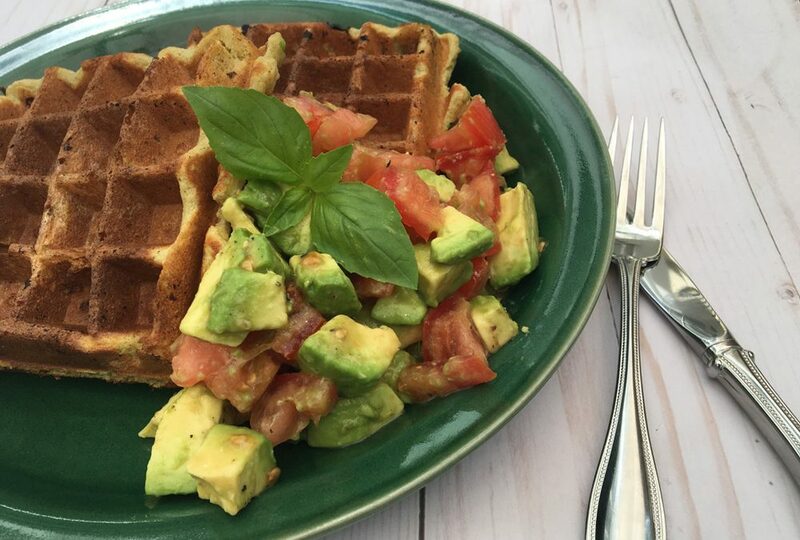 Healthy monounsaturated fats in avocados work perfectly in this gluten-free, low-sugar waffle recipe that can also be used to make fluffy pancakes. Avocados are king! Avocados have a multitude of health benefits, including anticancer properties and cholesterol reduction. They can also be used as a healthy fat swap in many recipes, replacing unhealthy saturated fats with wellness boosting monounsaturated and polyunsaturated fats. Best of all, avocados add healthy fat and texture and blend into the flavor profile of what ever recipe is being used. When we go to Maine in the summer, breakfast is a serious family ritual. We have a long farm table in the kitchen where everyone likes to hang out, eating and chatting, before the day takes on a life of its own. Most of the year, breakfast tends to be functional and quick; during the summer, time slows down and breakfast is an event with more elaborate meals prepared. 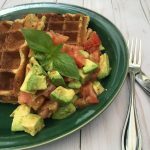 I love this avocado almond flour recipe because it is even more delicious than regular waffles and can be made sweet or savory. Prepare waffle iron with cooking spray and preheat. Combine all liquid ingredients, except whisked egg whites, together in the bowl of a stand mixer and mix until well combined. In 1/2 cup additions, add dry ingredients to the liquid ingredients, combining well between additions until all dry ingredients are added. Remove bowl from mixer and gently fold stiff egg whites into mixture until combined. Let mixture rest 20 minutes. Bake waffles and either serve traditionally with seasonal fruit and syrup or savory with a chunky avocado tomato salsa and a fried egg. Batter can also be used to make yummy pancakes. Looking for another avocado breakfast recipe? Try my avocado eggs recipe!